Chabad of Ramat Bet Shemesh has decided to officially support TOV in the upcoming elections. They are telling their people to hang TOV signs, to vote TOV and to push TOV as much as they can. That means that this additional boost of at least 500 votes (possibly more because of non-chabad people who support chabad) could well indicate that TOV now might even have the coveted third mandate in its sights as a very real possibility. Last night Gur of Bet Shemesh signed with Shalom Lerner. They announced last week that it was their intention, then they got cold feet and went running to Abutbol (related to national Gur issues). When Abutbol could not offer them anything serious, because he gave away all the jobs already to everyone else who signed earlier, they came back to Lerner and last night signed with him. 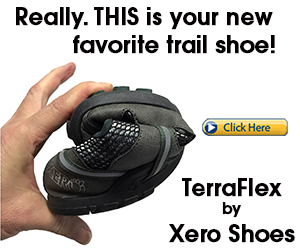 This is a big boost for Lerner and his campaign. Is Donald Trump's daughter Ivanka converting? The newspaper I read this morning had an item about Ivanka Trump, the daughter of The Donald, being in the process of an orthodox conversion to Judaism. Seemingly, she is dating Jared Kushner, Jewish and Orthodox supposedly (I don't know him, but that is what the paper said) and they plan on getting married, and she is looking into conversion to allow that to happen. She has chosen Rabbi Haskel Lookstein to be the converting rabbi. A quick search on google finds no shortage of celebrity websites discussing the possible conversion. They even say the Ivanka spent the recent holidays (Jewish ones) with the Kushner family, and ate in the sukkah every night of the holiday. That makes her an "Ainah Metzuvah v'Osah" twice over! She'll get plenty of s'char for that! Anyway, if this actually happens, that means eventually the Trump fortune will fall into Jewish hands. Also, now the meshulachim should feel fine approaching Trump for donations to their organizations, considering his daughter is about to become an Orthodox Jew! The real question though is if the Israeli Rabbinate will accept this conversion. Tzipi Livni announced that she is going to push to pass a law mandating civil marriage. She has had 5 years of power as a senior member of the ruling party with a fairly stable coalition (until the end), and she did not take advantage of that power to push the law she insists is necessary now. Now she has relatively no chance of passing the law, as most parties, and even a number of MKs in Kadima itself, will not support her or this law. True, because of Shas being a member of the coalition with Kadima she probably never would have been able to pass it, but her chances now are no better. Also, pushing this law will be detrimental to her future if Kadima should win the most seats in the upcoming elections. With whom will she form a coalition if she alienates Shas and UTJ now. It is nice to suggest that she for a coalition ignoring them, but that has never successfully happened, and it is unlikely she will gain enough power to be able to be independant of Shas, and other traditional or religious parties. So why is she doing this? Because she is try to show herself off as the person fighting for the secular against the religious hegmony. True, it iwll likely hurt her later, but right now she is just concerned about getting to later. She already began her campaign by portraying Shas as extortionists only concerned about lining their pockets. That was the first salvo in trying to bring the "secular vote" to Kadima. Now she is pushing civil marriage as the next step to get that vote. This is similar to Ehud Barak. Suddenly he is attacking non-stop the right-wing activists and settlers. He is demanding arrests, increased administrative detentions, condemnations, etc. What happened that past 2 years when he was Defense Minster where he remianed silent on these issues? What changed now? Only the fact that we are heading to elections and he has to look somehow to try to attract some people to vote for him. Even Netanyahu has recently insisted that the education portfolio will stay in Likud's hands and not be given to Shas as part of a future coalition. he knows that the secular do not want Shas controlling the Education Ministry. He too is trying to show he is not beholden to Shas and the secular should vote for him. Everyone knows this is all bogus and after elections, no matter who wins, they will come crawling to Shas offering them tons of money and important positions in exchange for their support. The Knesset is getting another Haredi MK. This one won't be helping to make the minyan for mincha though. The Haredi MK is none other than Jerusalem mom Tzviya Greenfield. Mrs. Greenfield is an anomaly, and I have been intrigued by her since she entered politics. Mrs. Tzviya Greenfield is a Haredi woman, as she defines herself and her family (and she is a Bais Yaakov graduate), yet she is a member of the Meretz party. Meretz as you all know considers itself a social party of people concerned for equal rights, yet is often seen as being extremely left-wing and extremely anti-religious. It is uncommon enough for a haredi woman to be involved in politics at all, as the haredi parties say a woman cannot be in such a position because of tzniyus problems (kol kvoda bas melech pnima), but not only is she involved in politics, she is part of what is seen as the most anti-religious party in the Knesset. Greenfield is becoming an MK because of Yossi Beilin's announcement last night that he is retiring from the Knesset. That pushes everyone in Meretz up one notch and she will get the vacated seat. Greenfield says that her being haredi and being a member of Meretz create no conflict. She believes in equal rights and the liberal platform of Meretz, and that in no way stops her from living a haredi lifestyle. I applaud her for being able to do something that in her community must be, and must make her, extremely unpopular, because she believes in it. Many in the haredi community write her off with a dismissive wave of the hand and say "she is not haredi, no matter what she says or how she lives". yet saying that means you can say "Meier Porush is not haredi" (as some in the anti-Porush camp are doing) simply because you disagree with him and do not accept his style, or say that about anybody you disagree with. Hatzlacha to Tzviya Greenfield in her new position as MK. My next question is why people ask who the rabbinic authorities are behind a candidate or behind a party? For example, why ask what rabbis CHEN or TOV consult with, or which rabbis support CHEN or TOV? After all, what really do I care? If I am considerign voting for CHEN or TOV, and if I want rabbinic approval for doing so, it does not matter to me who the rav of the party is. It matters to me if my rav says it is ok or not. So I should go to my rav and say, I am considering voting CHEN or TOV and want to know if halchically it is ok. The rav will say yes or know based on his daas torah or whatever, and then I will have my rabbinic answer. But why does it matter to anybody who somebody else's rav is? Another example - if I want to vote gimmel, I have a dilemma. Rav Kornfeld (and others) says vote Gimmel, but Rav Goldstein says vote Shas (or whatever he might say). So which rabbi is more important? So if one of the two rabbis is my rabbi, or I am closer with, I would likely follow his opinion over th eother's. But let's say neither are my rabbi - now which rabbi do I listen to? They are both big rabbis in the neighborhood, and if my own rabbi is not good enough and I have to know which rabbi supports a specific party, how do you deal with some rabbis supporting one party and others supporting other parties? If I am not just looking to my rabbi for an answer, but need to know who "their" rav is, how do I ever know how to vote? I ask the following questions, not as an attack on a way of life, but with the greatest respect and as an attempt to understand. Please read it that way and respond accordingly. Also, the questions are not really directed at the average native Israeli voter (not that there are too many of those reading this anyway). It is more directed toward the oleh from Western countries. 1. In the United States or in England, or wherever you are from, you would have gone into elections with a decision of which candidate you support based on the issues and the candidates policy on those issues. Issues that affect you more would sway you to one candidate over the other, based on which candidate addresses those issues and needs more. The rabbonim in America (I will stick to America because I am familiar with it, but I think it is the same in other countries as well) might tell people to vote, but they rarely tell people which candidate to vote for. And when they do, it is rare and generally because of a specific volatile issue. At what point do people make the transition from being able to vote on their own, perhaps with rabbinic guidance, to moving to Israel and only being able to vote depending on the announcement of a rav as to whom to vote for? What is different that used to allow you to vote for your preferred candidate, to arriving at the point where you will only vote for the ravs candidate? 2. 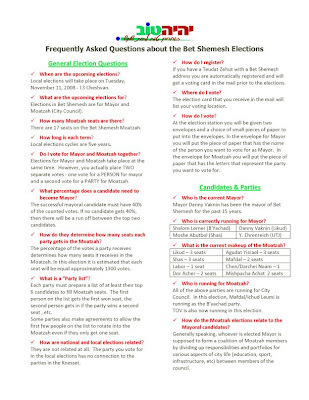 A second question is why the rabbonim and their voting preference is considered as anything but simply a recommendation, rather it is considered a mitzva and a demand? My issue with voting based on a rabbinic declaration (whether it be a local one, or a national one) is that the rabbonim are generally "nogei'ah b'davar". They will never look at the issues and say in this election party x deals with this issue more in our favor so vote for them, and in that election they say party y deals with our issues better so vote for them. That never happens. It is always vote for one specific party. That is, the party they support, the party that they are associated with. The party that funnels money to their institutions, sometimes even based on how strongly the rav is associated with the party. Why is the ravs opinion on voting, unless his opinion goes against the standard "vote for my party" line, taken as a mitzva? It is the clearest situation of a psak based on "negios" - conflict of interest.? For example. Rav Ovadia Yosef will always say it is a mitzva to vote Shas. Of course - he is Shas. Will he ever say vote Gimmel, or vote Labor or vote Likud because of a specific issue? Of course not. He has a conflict of interest, and cannot say anything but vote Shas, whether he wanted to or not. Can Rav Elyashiv ever say anything but vote gimmel? Of course not. You will never hear him say vote shas, or vote Likud, or vote Marzel, or vote Kadima. He cannot. (these names were picked as common examples - they are not attacks on these rabbonim). At what point do you make the transition from deciding on your own for whom to vote, to only voting based on the announcement from a rav? why are the rabbonims statements taken as mitzvos, when they are clearly "nogei'a b'davar" in these voting situations? And again, please respond to the point and do not take these questions as attacks. They are points I never understood well, and they always disturb me every time there is a new election season. how to pick a date for elections - the best of the reasons given..
UTJ - we are ready for elections at any time. But we prefer not to have elections on February 9 or the next day, because that is Tu B'shvat. Arabs - not in January - it is height of winter, and might rain a lot. We would get a low turnout because of poor infrastructure causing flooding. Wait until March. Litzman - Anytime but not the whole week of Tu B'Shvat because the chassidim go to rebbe's tishes, and would have a hard time getting back in time to vote. The following is the latest flyer put out by TOV. It includes images of and a short bio on the main people in TOV. As well, it includes some information of what TOV stands for. TOV is a party of the people, for the people, promising to work for the benefit if the people. TOV will work for improving quality of life, including roads, cleanliness, parks, etc. TOV will work to improve the educational system, and the system for the "at-risk" teens. TOV will work toward the fair and equal division of resources. Another interesting point out of the flyer is the announcement of the ticker symbol of TOV. They have chosen the letters עד. I dont know why they did not choose טוב. But perhaps these letters should serve as testimony to what they have promised, and will hold them to it. Unlike the normal campaign promises that are never kept. As the TOV slogan goes, we do not promise 100% success. We promise 100% effort. The decision is yet to be final, though it is mostly just a formality at this point. It seems like we are going to elections. Peres is meeting with Livni right now. She is informing him of her decision to go to elections due to her lack of success in forming a government. After that Peres will call the heads of all the various parties before he makes final announcement as to his decision. Technically, he could decide to appoint a different MK with the task of forming a government, but it seems likely that new elections will be announced. The irony of this is that this is only the second time in the history of Israel that the appointed MK failed in the bid to form a government. And who was the first? Shimon Peres in 1990. I love elections season. They are so exciting. And now we get three overlapping elections! US, municipal, and national. The best of the three are the national elections, because by law it is a national holiday. "Olmert on the threats by Right-Wing Activists: Their place is in jail"
Let's not forget that Olmert's place is also in jail. Perhaps they will even share a cell! We say that we are supposed to emulate the ways of Hashem. "מה הוא חנון, אף אתה חנון וכו" - "Just as He is slow o anger, so to you should be slow to anger. Just as He is merciful, so to should you be merciful, etc." so the gemara says. the end to the "shidduch crisis"? The solution to the shidduch crisis might have been discovered. All it takes, the theory goes, is a simple course for yeshiva guys how to talk to girls. Those silent moments in between questions? They will load you up with topics of conversation so you will not have any of those moments. They'll teach you how to decide. The truth is that the headline of the article is inaccurate and a bit deceptive. The article says the course is for "avreichim". Avreichim are married yeshiva students. When I first saw the headline, I assumed it was to teach them how to talk to women when they are at the point of leaving kollel and going to find a job outside in the general world. Then I read the article and saw it is for unmarried students and shidduchim. Voting from Israel - the event! Now it's easy to vote from Israel! You will be able to drop off your official ballot, or for those who have not received their official ballot in the mail there will be Federal Write-in Ballots available at the event. Check out the newest poll on the top right in the sidebar. For which party do you plan on voting in the upcoming BS elections? If I left out a party you think should be included, let me know and I will add it..
We like to laugh and criticize Shas for the way they dont seem to have any actual ideals and as long as they can get some money from the prime Minister they will join a coalition no matter how left wing it is. Nobody expected Shas to actually hold out against Tzippi Livni for the billion shekel demand they were making. Either they would agree to join her government for much less, as long as her offer would be substantial, or she would refuse to play along as she claimed. It turns out that Shas has stuck to its guns and is still holding pat for the full price tag of a billion shekels. They must know how desparate Livni is to become Prime Minister. So far they have pushed her offer up to 800 million shekels! That is pretty amazing! And if you think that she would offer them 800 million and not offer the final 200 to get them to join, we will see in the next few days whether that is a good assumption or not. I think in the end she will pay the price. I think it is a bad move on her part, but that is what she will do. Kol Hakavod to Shas for successfully getting her to offer so much. And if she makes the final offer a billion shekels, they'd be crazy to not join. They will never see that kind of money again. Even if she offers it, they'll probably never see it, but at least she will have promised it to them. If you remember, Rabbi Berland of Breslav had said that the value of the dollar would rise to 4.5NIS by Cheshvan. At the time the dollar was dipping into the low 3s, and people were very cynical about this "prediction". It turns out that the dollar has been fighting back and has managed to climb to a recent high in interday trading today of 3.8365. I don't remember the Haredi UTJ party ever being so divided in any previous election season as they are this year. they always squabble over which faction will get priority and jobs and the like, but the fights this time are really all out. Meier Porush got himself into some bad blood with other factions of UTJ in last years Beitar elections. he supported a rival candidate over the incumbent. the incumbent -Pindros - had been the Degel guy. Porush was acting within the agreement that had been previously signed, and his candidate was supposed to be the agreed upon candidate by all parties. Degel chose to not honor the agreement and they fielded Pindros again against Porush's candidate. Porush did not back down and kept his man in the race. Rubinstein, Porush's man, went on to win, and a lot of people got very upset at Porush. Now they are taking it out on him. And it does not just affect Porush and his candidacy in jerusalem, but all election campaigns in various cities in which UTJ has a position. One of those cities is Bet Shemesh. Gur, one of the parties upset at Porush, has decided that they will support Moshe Abutbol in bet Shemesh. 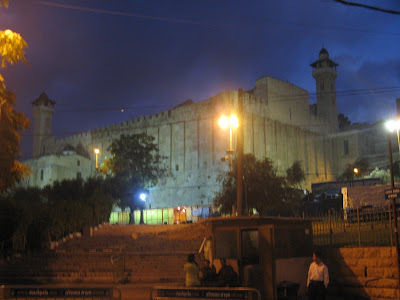 The condition attached is that Shas work against Porush in jerusalem. That puts Shas in a tough position, because Shas and Porush worked together in beitar for the success of Rubinstein, and they were expected to support Porush in jerusalem (ever since Deri's failed bid to join the fray). if Shas agrees and goes against Porush, it could be disastrous for Porush. So what did they do? In Bet Shemesh, Gur fielded their own candidate - a guy named Ehrenreich from Immanuel. This was obviously only done for internal Gur reasons, as he had absolutely no chance of winning anything other than possibly 500 or so votes from the Gerrer community. MK Litzman was using his candidacy to negotiate with the various other candidates and see from whom he could squeeze out the most. It turns out Ehrenreich has now pulled his candidacy and come out in support of Shalom Lerner. I do not know what Lerner offered Gur for this support, other than a vague promise of construction in the upcoming neighborhood of RBS Gimmel, and some positions in a new city goverance. This is big for Lerner, as it is his first agreement with any other group. On the othe rhand, I suspect it is still only temporary, as Gur is probably using it as a way to pressure Abutbol and Shas into an agreement. I don't know how Shas can agree, considering their relationship with Porush, but I do not see how Gur can support Lerner when all the other Haredi parties and factions have finally come out in support of Abutbol. We'll see what happens with that. I must say Degel signing an agreement with Abutbol makes it very tough on Lerner. The polls have shown him to be neck and neck with Abutbol even in such a scenario, but polls are rarely reliable, and the polls are already a few weeks old. Much has changed since then. In the meantime, the agreement between lerner and Gur has been acheived, and perhaps this will be the first of others, as Belz is also rumored to be following Gur in supporting Lerner. After that, perhaps others will follow. The big news today is that Iran has announced they have captured spies. the spies were targeting the nuclear reactor. Also, this is no the first time they have caught a series of spies spying on their reactor - last year as well they arrested spies. The funny thing is that the most recent arrests were made against two pigeons. Last years spies were 14 squirrels. I wonder if they have been able to torture any information out of them. Will they carry out hangings in the public square in the middle of Tehran to dissuade future spies? I can't believe this is who we are afraid of. This morning we went to daven "k'vasikin" at the Me'aras Ha'Machpela in hebron. I always love going there. Today, because of the holiday, Ulam Yitzchak was open to Jews. 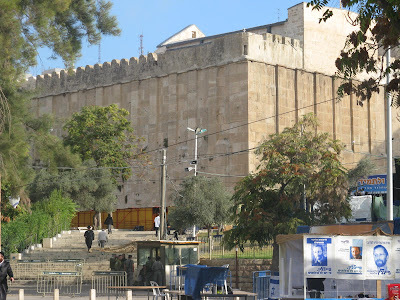 Many people get excited when Ulam Yitzchak is open, as it is only open to jews 11 days per year. I don't see the big deal, as the graves are beneath the ground in the caves, and as far as I know the markers and rooms in the building have no specific relevance or meaning. But it is a bigger room, and it also means for these days we have control of the whole building. One interesting aspect of the Me'ara is the debate whether kohanim can enter it or not. Normally kohanim cannot enter buildings in which dead bodies are buried. The me'ara has always had a dbate about it. Some poskim allow kohanim to enter the me'ara saying that the graves of our forefathers does not make one tamei. Therefore there are some kohanim that will enter the me'ara. I think most do not, but some do, and they almost always have nirkat kohanim in the me'ara. Here is todays kohein blessing us. After we finished davening and left, on the way back to the car we saw the booths being prepared. Today is the big day in hebron - they have a concert and a fair of sorts. The proprietor of the booth below was selling silver jewellry. I noticed the name on the both was "Sa-Nur Jewellry". Sa-Nur was one of the four Northern Shomron settlements that had been uprooted by Ariel Sharon as part of the disengagement. I asked the proprietor if that is where he is from, and it is. He had been one of the founders of Sa-Nur, and was evacuated when his home was dismantled. My brother in law has become a very serious "brisker". 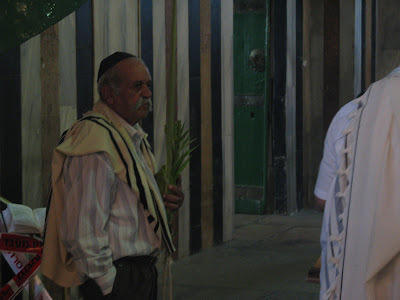 He is overly pedantic about his lulav and esrog, and spent three days looking around Yerushalayim for a lulav that would be satisfactory to his requirements. He could not find one. A couple hours before yom tov he calls me up to ask me if the lulavs I got were good and if there is a rav locally he could show them to. If not, he could not come for yom tov, because he did not yet have a lulav and would need to continue looking and would not have time to come. I said I dont know about a rav - he can try goign to the house of any rav if he wants, but an hour before yom tov is not very promising on that. I said I would look at the lulavim and give him my opinion. I looked and told him that the lulavim I got from the shul all look great, but I did not know if they would look great to him. he said ok, and came anyway. 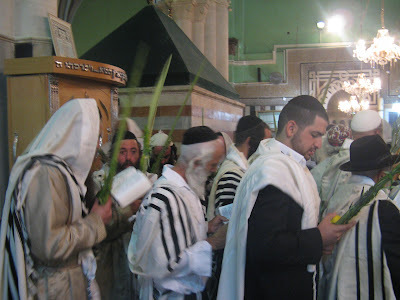 He took a lulav and went to shul in the morning. 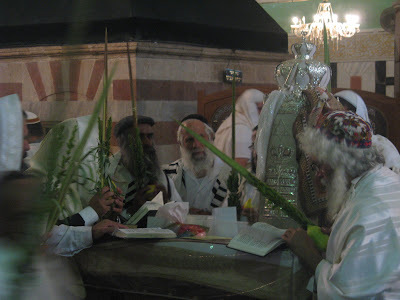 He showed the lulav to the rav of the shul he davened in (different shul than where I had bought them), and the rav was very impressed with the lulav and told him it is a beautiful lulav and asked him where he bought it. So despite my not understanding the costs involved and generally not wanting to pay so much for the 4 species, the quality of the esrogim and lulavim from the supplier for the shul was extremely high and was likely to be considerably cheaper than what he would charge for these in other years. Lipa around Jerusalem, meeting "simple Jews" (takeoff of name of his new album).. Normally I buy an esrog in a closed box. My theory is that I have little patience to look at esrogim that tens or hundreds of people have already handled and rejected. As well, I hardly know what I am looking at. All the marks look the same to me, so there is no point in my inspecting it the way I see plenty of other people inspecting. I figure, if a hechsher is good enough for me to rely upon for the food I buy, for deciding Jewishness, conversions and marriage, even for my laundry detergent, bleach, and paper plates, then it is also good enough to tell me my esrog is kosher. So instead of my inspecting the esrog just to look as frum as everyone else (which is the only reason I personally could ever have to inspect an esrog closely), I buy the closed box with the hechsher. The most inspecting I do is for where it is being sold cheaper. I see no reason to pay a hundred shekels for an esrog when I can pay 40 for the same thing. Granted, I am no big negotiator, and I am never good at bringing merchants prices down on anything, but if I wait until the prices naturally start to go down, I have saved myself a lot of money. Also, I will generally go to buy the esrog on erev yom tov when the prices start to go down. I am not quite daring enough to wait until very late in the day, when you can really get prices at the rock-bottom, but I do ghet them as they are beginning to fall. This year, buying esrogim and the other items are a bit more complicated. Because the esrogim still fall in the category of shmitta, because fruit still has shmitta restrictions for a few more months even though Rosh Hashana has come and gone, so you cannot just go buy an esrog. You can go, or you could have gone before Rosh Hashana, to a hefker field and pick your own esrog. the chances of you getting a kosher one like that are extremely small. The main source for esrogim this year are Otzar Beis Din. The "legal fiction" is that they say they are "distributing" esrogim and not selling them. I don't know - these guys who were "distributing" them at our shul for a nice price did not look like they would be doing it just to cover their costs. They must have somehow been sellign them for a decent profit. Otherwise why would they go through the effort of sellign them in RBS, or anywhere for the matter? bluke at The Jewish Worker has a good review of how the details of buying Otzar Beis Din esrogim works halachically. Not everyone, Rav Elyashiv is supposedly included in this list, likes or agrees with the Otzar Beis Din solution, so there is also a supply of imported esrogim. While the Otzar Beis Din prices are set pretty much in stone, the sky is the limit with the prices for imported esrogim. My shul made arrangements with a supplier to sell Otzar Beis Din esrogim, and lulavim and hadasim (they do not have the same shmitta restrictions for various reasons). Because of the short amunt of time due to the way the calendar falls out, and due to the complexity of buying shmitta esrogim, and due to some other technical issues, I decided to buy through the shul this year. I paid higher prices for my species than I would in a normal year, but I am told that the quality is so nice (they are very nice, but as I said, I am not a big mumche and it doe snot make such a difference to me), it is cheap to what I would have had to pay for an equivalent esrog in any other year. Not that I would have bought such a nice esrog any other year, but I guess it is somehow a good deal. I still find it hard to understand how when shmitta means everything is supposed to be free, and the Otzar Beis Din system means they charge for the costs, why things are so expensive. they say they are just covering the costs, but it seems the costs are so much higher than in regular years. And not just for esrogs. Otzar Beis Din vegetables (when they were available) during the year were also expensive. Why does it cost more to pick a cucumber and send it to the "store" during shmitta than it does the other six years? Anyways, that is the system in place and that is how I got my beautiful esrog this year. the one drawback is that you cannot just put the esrog in the "pach shmitta" and let it rot and throw it out. You have to wait a few months, savig it in good condition the whole time. Eventually you have to remove it and make it hefker when the "zman bi'ur" arrives. And then you can get rid of it. Watch out whom you give tzedakah to. The following story, really a funny incident when looking at it in hindsight, is exactly what the gemara refers to when it says that the frauds save us. By tricking us into giving tzedaka to people who are not worthy, and thereby causing us to lose faith in the recipients and therefore withhold tzedaka donations, they are giving us the excuse that saves us from judgement as to why we do not give enough. This incident happened on erev Yom Kippur. David Morris, the founder of Lemaan Achai tzedakkah organization, went to the area of the Dil V'Zol makolet on Dolev to set up a stand for collecting donations, as he does before all the holidays. As he arrives, he sees somebody else, somebody he does not recognize, with a stand collecting donations. the kicker is that this guy has a handwritten sign saying Lemaan Achai. He is told that the fellow is telling people he is collecting for a hard up family who needs to make a bar mitzvah. He approaches the fellow and tells him that he is welcome to collect, but not using the Lemaan Achai name. He is not allowed to ask for donations using their name, and he is tricking the people into giving money they would not otherwise give, and he is taking that money away from the real organization. The fellow got upset and started arguing. His main argument is "What's the difference? We are all "Achai" anyway"? David repeated that you can collect money as much as you want for whatever you need, but you cannot use the Lemaan Achai name and trick people into giving you. the fellow got upset and attacked David. He tried to hit him but some people came out of the store and blocked his path and protected David. In the meantime, the police were called. They came, gave a donation to Lemaan Achai - the real one (only in Israel would the police come to the scene and first make a donation before dealing with the situation), and took teh guy aside. When they understood what was happening, they told him he cannot use the name, and if David wishes to he could press charges for assault. David chose not to. The guy agreed to get rid of his homemade Lemaan Achai sign. 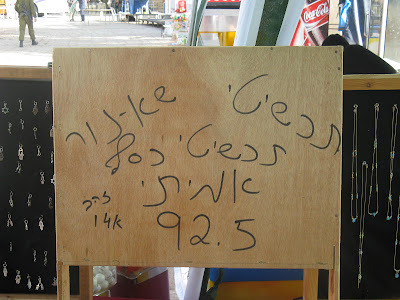 A few moments later he pulled out of his car a new sign that said Hachnassat Kallah, and continued collecting money. There you have it. We have to thank this fellow for giving us the excuse we need to be meritous in judgement as to why we do not give enough tzedakka. Sukkos is bearing down upon us almost as fast as a hurricane can hit the southeastern coast of the United States. And speaking of hurricanes, the meteorologists are expecting some nasty weather over the holiday, though not exactly hurricane quality. Here is the forecast for the first day of the holiday. Rain expected all around Israel. 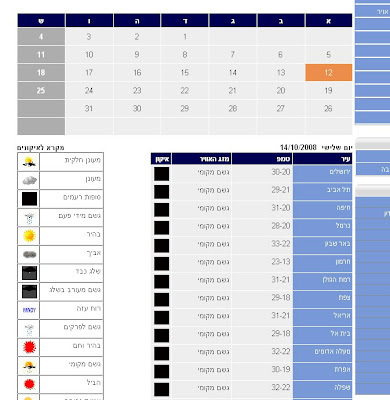 Depending on the weather site you look at, you will see different expectations as to how long the rainy weather will last - anywhere from 2 days until through shabbos chol hamoed. Rain over sukkos in Israel is very unusual. It happens to be that this year, sukkos falls out fairly late in the "season", so normally these rains would be post-sukkos, but this year they are during sukkos. The thing is that it creates a bit of a dilemma. On the one hand, nobody enjoys rain during sukkos. it messes up sitting, eating and sleeping in the sukka. It messes up travel plans. it messes up the general enjoyment of the holiday. Along with the fact that the gemara considers rain during sukkos to be a curse, because it is as if Hashem is saying even though you are trying to do a mitzvah, He is not interested and He throws us out of the sukkah by sending rain. On the other hand, we have such a serious shortage of rain (didn't the experts say we would not make it through the summer? what happened with that?) and water that every extra drop is really a blessing! The real problem is that because it is such a rare event, most people are probably not familiar with the laws of how to deal with rain during sukkos, such as when you can eat indoors, when you have to stick it out and wait for the rain to stop or even eat in the rain, etc. It is time to review these laws that have not applied here in a very long time! I have it on good word that the principal of the school that is currently employing the teacher under investigation for possible sexual molestation and pedophilia is willing to make a change to that situation. But it is dependent on certain things happening. Whether he was right or wrong for hiring the guy in the first place is moot, because he has already been hired. He truly believes in the teachers innocence, and he considers him a very close personal friend. The principal says he has not yet been contacted, either officially or unofficially, by the police or by social services regarding this case. He has not been told by them anything, let alone that the teacher is under a serious investigation or that he is a danger. The police either send him an official letter, or even just call him, stating that the investigation is serious and the teacher is truly suspected of what he has been accused of. The social services caseworker sends him an official letter, or even just calls him, stating that the investigation is serious and the teacher is truly suspected of what he has been accused of. One of the families involved meet with him. As of right now it is just anonymous people saying we were a family involved. That means nothing to him. If he could see a face and name and that person would tell him the claims are serious and it happened to them, he would fire the teacher. He would be willing to meet the willing parent anywhere, and he would guarantee the continued anonymity of the person he talks to - he just needs to know it for himself. Is this another delay tactic? I don't know. The person who met with him and heard this from him felt he was truly being forthcoming and not just finding another way to push it off. You ask, what about the restraining order? Doesn't that tell him there is something going on, even if there was a mistake in it? From his perspective it does not. As a matter of fact, he saw the restraining order and sees it as a way of the police avoiding telling him what to do. The police knew the school does not exist anymore, yet they wrote up the restraining order against that school alone. As well, anybody can get a restraining order against anybody just by their say-so with no proof of anything. If the order was serious, the police would not have written it against the original school only, and they would have fixed it immediately if it really was a mistake. So from his perspective, they had to give the order because someone requested it, but they did it in a way that they knew would not make the school get rid of him. So, if any of you are involved in the case and want to make progress on this, be in touch with the social services or the police about getting them to notify the principal. Or consider meeting with him yourself. Bet Shemesh politics has heated up this past week. As we get deeper into election season, it will continue to do so, but this week was particularly busy. This week was the deadline for various parties to submit their final lists for candidacy for city council seats in the upcoming elections. People listed in the various parties lists will be competing in the elections for seats, and the positioning of the name on the list determines your spot in the party and whether you have a realistic chance to win a seat or not. So all the various parties submitted their lists this week. There were some interesting developments. UTJ's local party is in for a tough fight. Lots of people have been upset at them for some time. Add to that a number of people who were upset because they were being left off their lists and they wanted spots. Some of those people have opened their own splinter parties, most of which have absolutely no chance of getting more than a few hundred votes each (if that much). The most notable of these are TOV (which was announced a while back), a "general chassidik" party, and a party of people from the Mishkenos Yaakov of RBS. UTJ I am sure will be fighting to have these people drop out of the race. All that will happen is that they will waste a few hundred votes each, thus weakening UTJ. UTJ settled their fight, it seems, about placement on the list. The Gerrer candidate for mayor, Ehrenreich, is heading the list at number one, with Shmulik Greenberg at number 2, and Moshe Montag at number 3. All three would be considered realistic spots, but they really have to get some of the splinter parties to disband and support them. If not, the number three spot could be in danger. The most unusual move of the week was I think Natan Sheetrit being convinced to abandon his candidacy for mayor under the Ichud Leumi party list, and join up with current mayor Danny Vaknin. Vaknin secured the number two spot on the Likud list for Sheetrit, and promised him to be appointed in charge of education after the elections. This is an unusual move because Sheetrit has very little support of people behind him. I am not sure why Vaknin was even interested in him. Perhaps it was just to be able to show he has people behind him. The most unusual aspect of it, to me, is the fact that Sheetrit's whole selling point why he should be elected mayor is that he is the only one who has fought local corruption. The way he fought it was that after the last election in which he lost to Danny Vaknin, he appealed to the courts to overturn it. That was his big anti-corruption fight. But considering that he has campaigned on the line that Vaknin is corrupt and he is the "anti-Vaknin", it is unusual that he has now joined forces with Vaknin. A few parties submitted some very well developed lists, refreshing their ranks and putting very hard working and impressive people on their lists, even if in unrealistic spots: Mafdal, Shalom Lerners party put together an impressive list of people, including our good friend David Morris in the number 5 spot. TOV put together a nice list, including Rav Alon, which will pretty much guarantee their passing the threshold and make their fight really for the second seat. The list is headed by Eli Friedman, Rav Alon and Mendy Newman, with other spots going notably to Ari Rosenstein at number 4, and Rav Raviv Shaked at number 7. This list is pretty good and should make their fight for the second, or even a third, seat on the council. The next one is what i consider the best, and perhaps most surprising, move in local politics this week. It therefore will get its own bullet, even though it really fits in this category. CHEN submitted its list for the upcoming elections, and they made a brilliant move. CHEN pretty much had no presence in RBS in the last elections, and since then as well. Losing Rav Alon (to TOV) could potentially have been a big blow to CHEN. They made a brilliant move and somehow convinced Ephrayim Naiman to officially join CHEN (he had been working with them for a number fo years unofficially) and include his name in the number 2 spot on the list. The list is headed by Zvi Wolicki, Ephrayim Naiman and David Geudalia. In my eyes, getting Ephrayim Naiman on board is the most brilliant political move of the week. he is a powerhouse here in RBS. Everybody loves him because of how much he does around the neighborhood and because he, and his whole family, is just a great and positive person. They should surpass their expectations because of signing up Ephrayim. Election season should keep getting more interesting, but I hereby give the award of "Brilliant move of the Week" to CHEN for getting Ephrayim Naiman on board. May your tefillos be accepted. The metro newspaper 24 Dakot today reported on a psak by Rav Weiss from Kfar Ha'Roeh. Kfar Ha'Roeh is a religious yishuv near Hadera and Rav Weiss is the rav of it and is also a popular rav for kashrus and many other things in the National Zionist community (or at least used to be - I have not kept up with him and his standing in recent years). Yom Kippur has come to be known as the Day of Bicycles, because many of the non-religious people refrain from driving on YK, but they go out in droves riding bicycles. As a matter of fact, there was an item the other day in the paper about the increase in sales of bicycles for Yom Kippur. 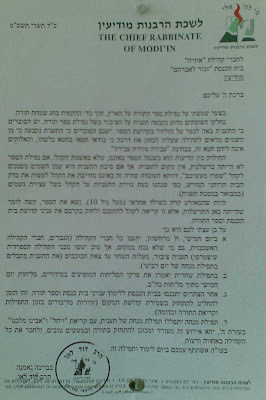 Rav Weiss wrote a psak, that he sent to the religious council of the area, along with being hung in the local shul, in which he added rollerblades to the list of things that should not be done on YK. The article quotes him as writing,"It seems there must have been a sale on them recently, and [the kids] ride them near the shul. When the small children come with the bikes with training wheels, that is something else. But from the age of chinuch, 9 and up, we should expect our children not to ride and shabbos and holidays with these various "rollerim". Obviously, by us we do not ride bicycles on Yom Kippur, and better to also not ride with the rollerblades." How many answers do you know to the age old question "Why did the chicken cross the road?"? But we now have a new answer... To get away from the Shochet! Some chicken was used for kapparot at one of these kapparot stands in Upper Nazareth. Before the shochet could whack it, the chicken made a daring escape. For three days he eluded the search parties, and wreaked havoc around the neighborhood waking local residents with his cackling. After three days they finally caught it, and brought it to its executioner to meet its fate. This time, there was no escape. one positive result of this incident, is a new answer to the above question.. The train from Tel Aviv to Bet Shemesh also has a regular minyan. It is not quite as famous or as popular as the minyan from Bet Shemesh to Tel Aviv, but a minyan there is nonetheless. The minyan I am talking about is the mincha minyan (soon to be maariv, as sunset gets progressively earlier). So I go to the car where the mincha minyan meets, because I had not yet davened. Sitting there is a sefardic fellow with no kippa talking on his cellphone. Some background before I proceed. The minyan meets in an area between the last two cars. At times there are other people there as well. Sometimes they leave when the minyan starts and move to a different part of the train, and sometimes, more often actually, they stay there. Most people know the minyan is going to be there, and it does not bother them. The minyan asks nobody to move, even when at times there are women there, and at times they are inappropriately dressed. As well, the minyan asks nobody to stop talking. So the minyan starts and this sefardic fellow is sitting there talking on his cellphone. 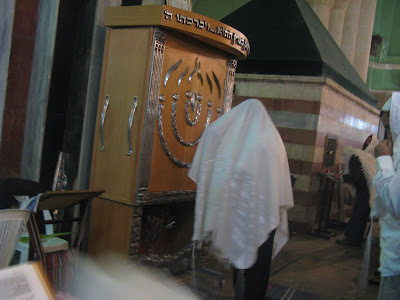 As soon as we started shemoneh Esrei, he disconnected his phone call, stood up, covered his head with his hand, and waited. When we said the kedusha, he answered along with us. When davening was over, he made his phone call. 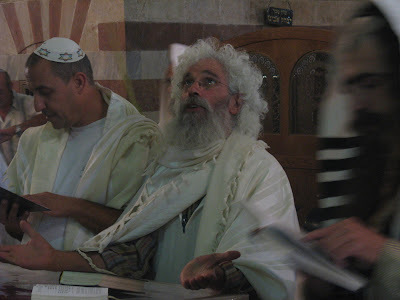 On the other hand, in the middle of the repetition, at the other end of the minyan, a Russian gfellow appeared because he had wanted to scream at somebody on the phone. I guess he did not want to do it in his seat, so he came to the area of the minyan to scream at his friend. From about halfway through the repetition until the end of mincha, this Russian fellow was standing there screaming(in Russian) into his cellphone at somebody. There is the difference between a sefardi non-religious person, and a Russian non-religious person. The Russian comes from no background. he probably had no idea what we were even doing, nor that he was possibly disturbing us. The sefardi, while also not religious, knew what we were doing, and felt it important that he should be respectful during the services even though he was not part of them. Rav Mordechai Eliyahu is famous for having been one of the students of the Baba Sali. He was considered the best of the students and is known to be a brilliant kabbalist, along with his other qualities. There is a story that is clouded in mystery. Supposedly, before the Baba Sali's death, the Baba Sali gave to Rav Eliyahu a gold watch and told him that this is the watch of the mashiach. He supposedly said that when the watch would strike 12 the mashiach would come. The watch was obviously not a regular watch and its hands did not move at the speed of a regular watch. Over the years, every once in a while, it would advance by some time. Over the past few years, rumor has had it, that the watch, which remains locked up in a safe in Rav Eliyahu's home, had hit a minute to 12. If true, it is meant to be an indication that mashiach is close. But it stayed at 11:59 all this time and did not advance any further. Rav Eliyahu has been sick and recuperating in the hospital recently. Reports now have it, or perhaps it is just rumors, that the watch has advanced to 12. In the article about it, some of the details are different than those I have heard over the years, but they are insignificant differences (such as I heard Baba Sali gave it to him but in the article linked it says Baba Sali's son gave it to him. I heard 11:59 and article says 11:55). It is worth noting that Rav Shmuel Eliyahu says nobody has seen the watch recently and nobody dares to go check it out. They are waiting for the rav himself to feel better enough to go home and look at it himself. That being so, I do not know how rumors could have started that the watch has struck 12, if nobody saw the watch recently. Halevai that the rumor should be true and the arrival of mashiach should be imminent! I have no problem with going to Uman for Rosh Hashana. 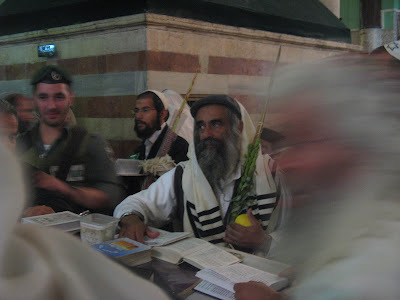 I think in the past I did, but I have reconsidered and decided it is ok. That is, I understand why Breslavers, or other people who somehow feel the connection to Rebbe Nachman as, would go to Uman. It is like any chossid leaving his family to go to his rebbe for yom toc, or yeshiva alumni going back to their yeshiva for yom tov. And that happens all the time. The fact that Rabbi Nachman is dead does not make it much different. And then there are the people who go for the experience of being there. Looking for inspiration perhaps. Perhaps some just want to be where the excitement is. Now, I should reiterate, he told me these were some people. Not the standard peson who was at Uman. Not the breslavers, not the regulars. But some people were praying like that. This is not a frum problem. This is not a Haredi problem. This is not a Jewish problem. This is simply a human problem. In every society there are people who have all sorts of problems, some of them including sicknesses and inclinations that prod them to molest children, or other inclinations. Some people with such inclinations control those urges successfully and function normally, and some do not. It happens in every community, in every society, in every country. It is not a frum or haredi problem. As well, in every society there is also the tendency to not act on information that brings these cases to attention. Not just in the frum community, but you can see examples of this throughout the world - the cases of an alleged molester being immediately dealt with are much more rare than the cases where he retained his employment. Perhaps the employers are reluctant to believe the accusations. Perhaps in some cases they have external pressures and reasons why it is difficult for them to remove the alleged molester. perhaps in some cases they really do not believe it with good reason. Perhaps they have seen enough cases where the accusation was baseless and brought out for other reasons and not really truthful. Nobody wants to protect a child molester, and nobody is doing what they do because they think he is molesting kids on their watch and they are ok with that. I really think the school that does not remove such a teacher is not doing it because they are willing to take the risk, but because they really do not believe the accusation to be true. Believing it to be true means they made a bad, a very bad, decision in the first place. That is something that is not easy to own up to and face. The new revelations in the case are a natural progression of events. The police have given a tzav harchaka, or a restraining order against the teacher. There seems to have been a technical glitch, and they issued it only against his teaching in the old school that no longer exists. I am told they are correcting that. On the one hand, this is a natural progression of the investigation. He was finally questioned, which was also a natural progression of events, not really a breakthrough in the case, and this is a result of the questioning. The restraining order is a breakthrough because it means the police have "concluded" from the round of questioning that the claims have basis and are not just mistaken or a misunderstanding or false accusation. Obviously they still need to finish the investigation and get conclusive proof, and that is usually not easy or a slam dunk in these cases. More often then not, these cases are closed with not enough proof. Does that mean the alleged offender did not do it? No. It is like saying if a tree fell in a forest and nobody was there to see it, it did not happen. Or if you stole a diamond ring from someones bedroom, but they have not pinned it on you and proven their case, does that mean you did not do it? No. But if the case fails to be proven, as happens more often than not, he will be allowed back to teach and be presumed innocent. That is the way the system works. At other times innocence is proven and then he is rightfully allowed back in, but usually it is the lack of proof of guilt, and not the proof of innocence. The police have confirmed that there have been 3 solid complaints from children (there were others that were "withdrawn"). The police feel that there is something strong here. The problem is that in court the testimony of 7 year olds doesn't always hold water. All of the complainants have been informed and the police have asked to publicize this. 3) keep the kids safe as long as possible..because the school is a private school there is no Misrad Chinuch jurisdiction, they are limited in what they can do to keep him away from the classroom, and the tzav harchaka is basically there only option right now. So, again, this is not a haredi or a frum problem. It happens all over and there are sick people in every society and community. Yet we, the frum community, purport to be of a higher moral caliber than others. We claim to be living the correct and more moral way. Being the am segulah and being the part of the nation that considers itself the elite does not just allow us to hold our noses high and look down on the other communities. It also gives us an obligation. It also means we have to hold ourselves to higher standards. So yes it might, it does, happen in other places as well. But we have to deal with it differently. We are not like them. We do not consider ourselves like them regarding anything else, and we cannot therefore allow ourselves to react like them now either. Now is the season in which we hear Jews become carpenters. Everybody is banging away with a hammer on sukka boards. Some of us wait until after Yom Kippur, but plenty of people have already begun. The construction of the sukkas can be heard, in religious neighborhoods, at all hours of the day and night. There is always someone invariably banging away at midnight or even 1am. I can pretty much sleep through a nuclear war, and if I was asleep that early on any given night, the noise of the hammer would not bother me. But it bothers other people. The law says all such noise must be stopped at 11pm. 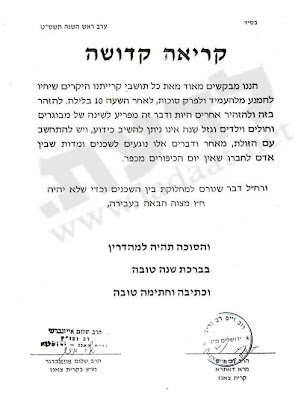 The rabbonim of Kiryat Sanz have decided that 11pm is also too late and have said that people in their neighborhood should not make noise constructing their sukkahs after 10pm. The reasoning used in the psak is very honorable, as it disturbs the elderly, sick and the children from their sleep. Even Yom Kippur does not atone for sins between man, so gezel sheina is very serious. Sukka should not be a mitzva achieved via a sin. While these types of stories generally happen with Christians finding images of either Jesus or Mary in various items, such as grilled cheese sandwiches or oil spills, it has now happened with Allah and a mango. This has led me to wonder what such a story would be like for a Jew. Whose name would we find in our kishke or potato kugel? What image would we spot in our latke oil? Would we find Moshe Rabbeinu's image? How would we know it was him - would it look like Charlton Heston? Would we find Theodore Herzl, Vlad Jabotinsky, David Ben-Gurion or Menachem Begin peeking out from our cholent bowl? Perhaps the Rambam, the Ramchal or the Chofetz Chaim would be spotted in the shabbos candle wax? While I was out running last night, I had the opportunity to pay attention to some election campaigning by Shas candidate for mayor of BS, Moshe Abutbol. The opportunity presented itself in the form of a sign on the back of a bus that I happened to be running behind for a few minutes. The sign said "There are no secular, there are no religious, we are all Jews. Vote Moshe Abutbol". It is actually a brilliant approach. He knows that many of the old Bet Shemesh secular and traditional (really the traditional more than the secular) residents would not vote for a Haredi candidate for mayor. They think of the haredim as having stolen their city from them, as the haredim have moved en masse to BS and have nearly become a majority in the city over the past 10 years or so. Even though Abutbol is haredi, he makes absolutely no mention of it in his slogan, and he had no picture of himself on the sign. He did not say "no haredi and no secular". He said "no religious and no secular". He does not want the old BS people thinking about the word haredi in his context. As long as they do not associate him with haredi, he has a chance of getting their vote. 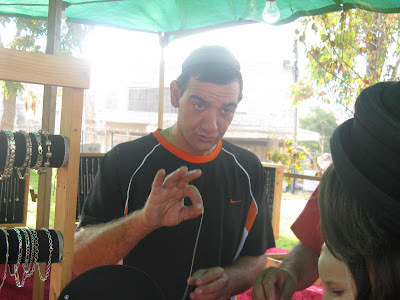 he is one of them in a sense - he is sfardi, he has been in BS for a long time - over twenty years. As long as he does not remind them that he is haredi and represents a haredi party, he has a chance at getting their votes. What is really slick about it is that while he is playing down his being haredi as much as possible during his campaign, he comes to the other haredi party, UTJ, with a complaint how can it be that they have not come out supporting the haredi candidate. He runs portraying himself as not haredi, but just another person, but then attacks UTJ for not supporting him. The truth is that he is probably better off, for now, without their support. When they come out in support of Abutbol, he will start losing his support from the old BS people. It is not Shas that has taken the city from old BS - Shas has always been a power in BS, since its formation. It is UTJ people who have moved to BS the past 10 years making it nearly a haredi majority. So, Abutbol should really stick with his current slogan, and hope that UTJ continues to take its time coming out in support of him. Here are some random things that happened on Rosh Hashana that stuck out, some of them funny, some of them not..
During the Torah reading, the ba'al kriya mistakenly said "Zareich" instead of "Zar'acha". Both mean your child(ren), but "zareich" is the feminine usage (children of a woman), while zar'acha is the male usage. When the mistake was made, my 7 year old immediately laughed (I was surprised he even noticed it), and said "he said Avraham is a girl!" We woke up the second day to find a bird flitting around the house. I could not find an open window, and could not figure out how it got in, but I opened the door and tried to chase it out. The poor thing flew into a ceiling fan and hurt itself. It then hopped out of the room and then flew (at low altitude) out the door I opened for it. Kids enjoyed tashlich as we went down into the fields, with many others from the neighborhood, on the edge of RBS to a well/spring (that doubles as a mikva) in the middle of a field. It made it seem like a tiyul, so that was fun. We all enjoyed the simanim, from the carrots and beans to the sheep's head, all except for the fish head. Highlights were, of course, the apple in honey and the fish candies. I am not really sure that getting the exotic fruit for she'he'chyanu (this years was a gauva rather than the quince) would really qualify, on its own, for the bracha. Nobody really likes any of these fruits they sell for Rosh Hashana, and we seem to eat it in nibbles. It is a good thing we are making the she'he'chyanu anyway and not just for the new fruit. During my post-Rosh Hashana run (I know, these were supposed to be thoughts from Rosh Hashana, but I think motzei also counts), I noticed a big difference between RBS and BS. RBS is pretty much a dead town. The streets were quiet after the holiday - I guess everyone is washing dishes and taking showers. In BS things were happening. People were out all over the place. Burgers Bar was jam packed, the pizza shop nearby was busy, other food establishments were getting ready to open, people were milling about, etc. Rosh Hashana is now behind us. Many hours spent in shul, with invariably, some high points and some low points. 3. Kee K'shimcha - this is sung with a haunting tune and points out and reminds us of the frailty and fragility of our lives and of our existence. This is especially powerful juxtaposed by the next tefilla "Ayn Kitzva" which is sung with a hippy and skippy tune pointing out the the awesomeness and infiniteness of God and demanding (?) that He act (in forgiving us?) for His own sake. 2. B'Rosh Hashana Yi'Kaseivun - this tefilla is powerful for me in the sense that it invokes the realization that the judgement we are facing is not just a simple you will live or you will die, but there are so many choices and options and different ways to how we can be judged. 1. Areshet S'Faseinu - each time after we blow the shofar during the repetition we said this tefilla. It is not enough that we blow the shofar and arouse the remembrance of the akeida, that we wake ourselves up to do teshiva, and all the other symolic meanings of the shofar. Not just that, but we then say a short tefilla, with a powerful tune, asking that Hashem actually listen to our tefillos, as He listens to the shofar, and accept them with mercy. Some people, including religious MKs, are making a big deal about information that leaked that Tzipi Livni and Ehud Barak held talks and negotiations during the holiday about forming a coalition. Tzipi Livni's response, via a representative from Shas (who will be having meetings with Livni tomorrow) is that the phone calls were only made after the holiday was over. They do not understand that the problem is she did not wait until the time of Rabbeinu Tam before she made the phone calls. Immediately after the earlier time of the conclusion of the holiday and they were already on the phone!